A little rain can’t stop our Queen! Want to see more of my 2017 Festival Photos? Can you find yourself in them? When the popup window shows, enter your email and you will see most of the images I took of that category. I have even more to see at the studio if you are interested. You can order reprints online or at the studio. 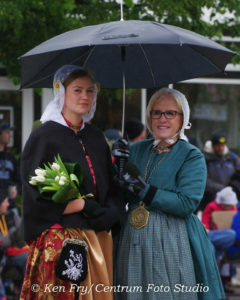 Despite the grey days, cold and rain, I got some great photos of the Festival and of our beautiful Queen and her court. I will be periodically be adding more to these galleries for your viewing. Enjoy! This entry was posted in Tulip Festival, Uncategorized and tagged Bands, Celebration, Iowa, Orange City, Parade, POD, Tulip Festival by admin. Bookmark the permalink.